I arrived nice and early in London. 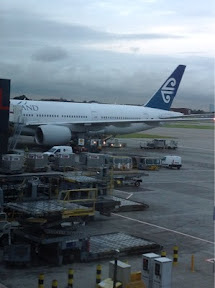 So early that I could of caught the earlier flight to NZ via LAX, but it was too difficult, I had to ring the NZ staff travel office, which I did, only to discover that the phone number is not recognized. I decided that it would be good to have a look at tower bridge and Covent Garden, as they were two places that I wanted to see on the way to TLS, but didn't have time. I am always surprised at how slow the London underground is. It took about 1:20hr to get to tower bridge. When I came out, there were people everywhere! I mean thousands. It was like a football match had just finished, except these people weren't going anywhere. Lots were going into the Tower of London, but most were just enjoying the sights and soaking up the atmosphere. 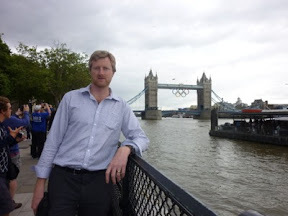 The Tower Bridge looked good with the Olympic rings hanging down below. 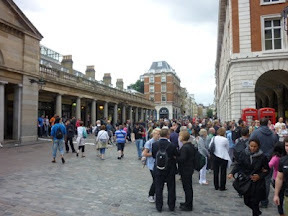 I didn't hang around, I made my way to Covent Garden which was even more packed. London is just going off, there are people handing out free stuff, buy a newspaper get a free union jack flag ( or 3 if you talk nicely to the girls selling the paper). I wished I could have stayed longer, but there were problems with the trains in the Underground, so I knew I had to leave enough time to get back and get my bags that I had stored at the airport, if I didn't get back within 4hrs I would have to pay double. I caught the Piccadilly line one stop from Holborn to Covent Garden and it was horrendous with people cramming into the train. I decided that rather than try get back on to the overcrowded, slow Piccadilly line, I would walk back to the Central line that was less crowed and went a lot faster and hook up with the Piccadilly line later, which is what I did. When I got to the Bag Drop, I explained that I was only a few minutes late and do you think she could let it slide - "No" was her answer in typical British fashion, "the computer dose it all, it is out of my control, sorry" she wasn't in the least bit sorry, but the computer was, and it only charged me for the 4hrs anyway, much to the disappointment the pretty young blond cow behind the counter. I made my way through security and immigration. Had a diner before going to the gate. On an old 777-200, still it all good in Business Class. So I have now watched two movies and we are not halfway to HKG yet. My plan is to try stay awake as long as possible so that on the next leg I can have a better chance of sleep, which will get my body clock closer to NZ time. Sounds like you've had lots of adventures on your way home and right into the travel thing. Can't wait for you to get home.